Fame, the digital entertainment network, has launched India's first live video entertainment application. Currently in beta, #fame is available on iOS and Google Play, enabling performers to beam live to fans and audiences using their smartphones. Download of the application today it’s free!! Now you can watch me Live on #Fame App (#FameFashion) from 1:30 pm to 2:00 pm from 21st July to 31st July. You can also do a live chat with me on the App. 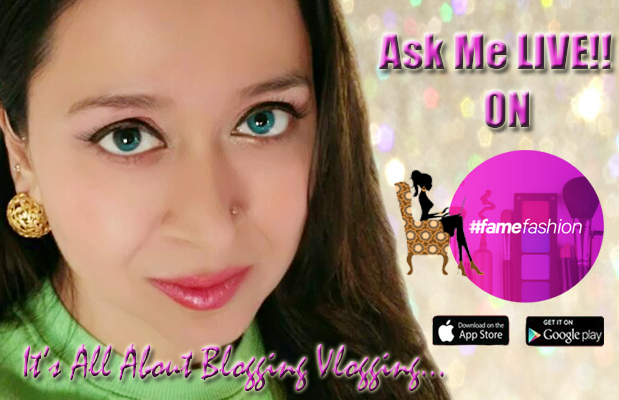 By popular demand I was invited to the app as a Blogger and Vlogger, to speak live on Fashion and Beauty!! I want thank #fame team for giving me this opportunity to speak to you live on the app, I have written a blog post on Karan Johar's Lakme School of Style and Yes, I wanted to be a part of it but everything happens for a reason as there are no accidents... (In the wise words of Oogway!!) but eventually I am a part of #fame and I love it. I have already aired two live beams and if you wish you watch me, I am going to beam live till 31st July on #famefashion. Each beam will be 20 minutes long and the timings might change after 31st July. I will definitely inform you about that!! Your Favourite Bloggers/ Vloggers, Celebrities, Singers, Comedians are now on #Fame. It is some what like the Frankly.Me App only on this you get to speak to me LIVE!! Karan Johar has launched his first fashion magazine with #fame on Youtube, also all the stars of the silver screen are on the #fame app. You can also see the IIFA AWARDS night on fame. 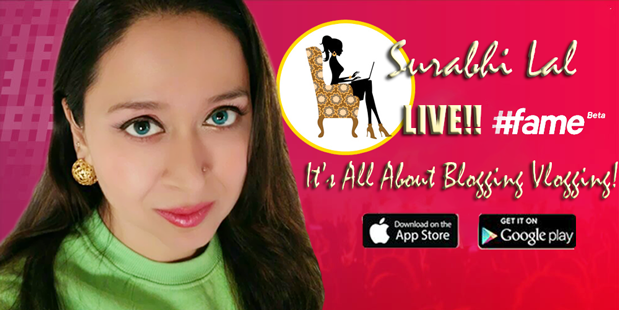 This is one of the app's to look out for and you will love the live beams and the tadka of fresh talent!! #fame was launched in Sep 2014 and has been developing digital show it is one of the India's largest creators of original digital video content. Apart from the mobile application, #fame's digital video network spans several digital and social platforms including YouTube, Facebook, WeChat, Dailymotion amongst others. #fame strategically focuses on emerging and established talent to build digital video channels and communities around them. You too can stream yourself live on #fame!! Register yourself on the app. It is the ticket to superstardom. Go Live and stream your talent to the world. Connect with your fans, make new friends, chat and become famous. You can sing, juggle, hack, dress up, make up, cook up, chat up, dance, party, sleep and then some more. This is your stage and the whole world is your audience. Fame was never this easy. "It's All About Blogging Vlogging!!!"